University of Chicago Press, 9780226476964, 728pp. Founded in 1965 and still active today, the Association for the Advancement of Creative Musicians (AACM) is an American institution with an international reputation. George E. Lewis, who joined the collective as a teenager in 1971, establishes the full importance and vitality of the AACM with this communal history, written with a symphonic sweep that draws on a cross-generational chorus of voices and a rich collection of rare images. Moving from Chicago to New York to Paris, and from founding member Steve McCall’s kitchen table to Carnegie Hall, A Power Stronger Than Itself uncovers a vibrant, multicultural universe and brings to light a major piece of the history of avant-garde music and art. "With A Power Stronger Than Itself, Lewis exceeds expectations. For rather than merely recount the ascent of the AACM, he elegantly sets it against the backdrop of cultural, racial and social changes that shook the twentieth century. . . . Lewis unreels this tale with dramatic flourish and scholarly authority, in effect telling the story of not only the AACM but also the city where it’s centered, Chicago." "Lewis’s landmark book. . . goes deeper into the formation and development of the AACM than any previous history, and as a formal acknowledgement of the group’s enormous importance and influence it’s long overdue." "This could very well be the most anticipiated book of the year. . . . The long wait is now over and patrience will be rewarded. George Lewis's encyclopedic knowledge, thorough research and in-depth interviews have produced an eye-opening work. . . . Overall, it is a pleasant read, scholarly but not overly academic in tone, covering a wide stylistic range--from essay to storytelling to autobiography." "[Lewis] sets a new standard for scholarly writing about the people who make Great Black Music, or any other kind.. . . . Reading Lewis's book about the AACM makes one want to have been a part of it." 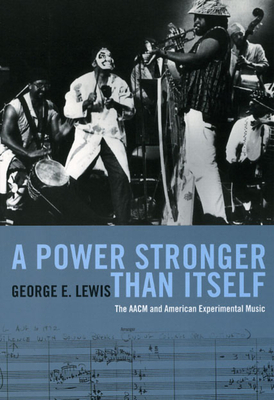 "Simply put, George E. Lewis' new and long-awaited history of the Association for the Advancement of Creative Musicians (AACM) must be considered among the most important books ever written about creative music. A tour de force of narrative history and analysis driven by a clearly articulated point of view, it draws on a massive body of scholarship and original research that places Great Black Music in its historical, aesthetic, and social contexts. It will certainly shape the scholarly, critical, and public discussion of jazz and creative music for years to come." "Rich and dense and gratifyingly readable. . . . [Lewis] makes a scholarly portrait of a complex community into a ripping good and inspiring yarn." "Very dense but very readable, filled with fascinating stories, capsule bios and rewarding side trips. Lewis has a gift for explaining abstruse ideas without dumbing down. As a reader, I'm torn between wanting to savor it slowly and devour it fast. Two hundred pages in, I've got weeks worth of stuff to think about." "An unequaled volume on both its subject and on Black creative collectivity." "Lewis' writing is lively, avoiding the trap of sounding too academic and instead creating a story that is compelling in its portrait of musicians dedicated to their art. This is a fine work on an area of jazz that deserves wider recognition and greater understanding." "This essential book is music history from the inside. . . . Lewis is telling an interesting and important story here and telling it well. Anyone who is interested in modern serious music will learn from and enjoy this outstanding book." "An illuminating, articulate panorama of a little-examined yet highly influential organization, one whose 'graduates' have permeated every element of modern music." "The crystalline study is thoroughly engaging. . . . Even the most dedicated improvised music aficionado will find anecdotes, relationships and hitherto unknown performances and biographies laid out in stunning detail. . . . The book is a graceful intertwining of oral history, hard research and insightful scrutiny of a complicated organism." "More than any other recent new-jazz-studies or improvisation-studies monograph, A Power Stronger Than Itself draws clear connections between the collective history and aesthetics of a community of improvisers and the musical procedures they have employed."